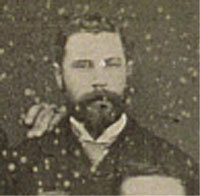 Vice President: 1893, 1894, 1895. Hon. Sec: 1885, 1886, 1887, 1888, 1889, 1890, 1891. Hon. Sec. Second Twenty: 1881, 1882, 1883, 1884. Photo from Tasmanian team trip in 1888. May have had a brief playing career, but was a hard working, long time servant for the club. Carlton F. C. club secretary, committeeman and captain of the Second Twenty/Reserves. In 1887 Billy had lived in the Carlton area for 20 years. After captaining the Second Twenty he was the hon. secretary of the second twenty for four years. 1881 W. Donaldson as a wing and centre man played exceedingly well. "Mr. W. C. Donaldson's connection with the Carlton Football Club dates back many years. He was hon.secretary for the Second Twenty for four years and has been seven years hon. secretary for the club. He has been connected with the Victorian Football Association for a number of years, and has taken a leading part in the affairs of that organisation. Mr. Donaldson is a thoroughly conscientious, zealous, and energetic worker, and the Carlton Club committee were fortunate indeed in securing his services, both for club and association duties. He was been the recipient of several handsome testimonials." 1897 At the very first game at Princes Park June 22 1897, Carlton stalwarts of the past including Billy Donaldson, Jack Donovan, John Gardiner, and George Robertson attended. Relation to G. Donaldson and C. Donaldson ? Page last modified on Thursday 14 of July, 2016 16:24:44 AEST by blueycarlton. 1991 Rd 6 - Andrew Cavedon & Ex Blue Ian Muller fight it out.